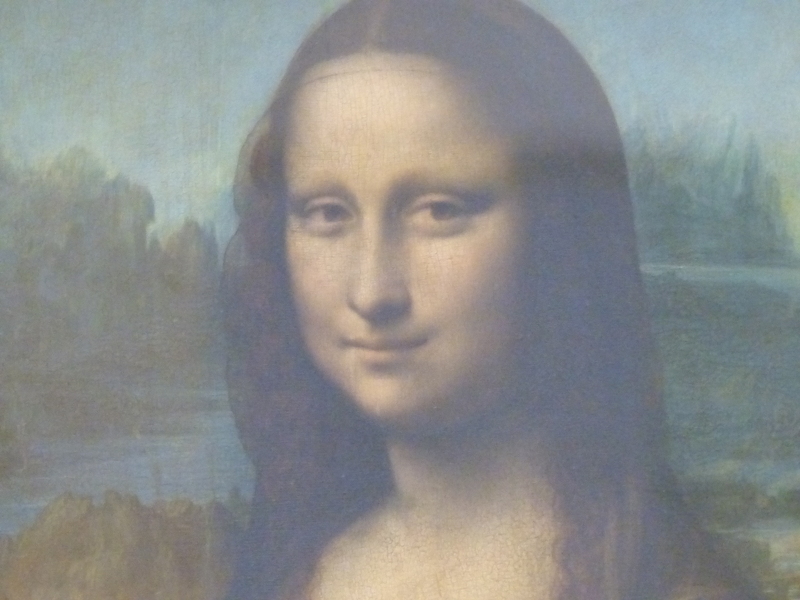 That Mona Lisa Smile – Run. Ride. Roam. First the weather report: It hit 28C today! Finally, some nice warm weather! I had to break out the shorts and they haven’t seen the light of day since Seville! I dazzled the Parisians with my stunningly bright and blinding “Tassie tan”, but that’s one of the bonuses of travelling…I don’t know anyone, I will never see these people again, I can be as daggy as I like, so my knobbly knees and wonky legs sporting their brilliant shade of white were happily on show for all to see! We started the day with a trip to The Louvre and spent a few hours wandering the halls and galleries looking at the amazing works on display. To be honest, even if the art wasn’t there, it’s worth a visit just for the building, which was a work of art in its own right. 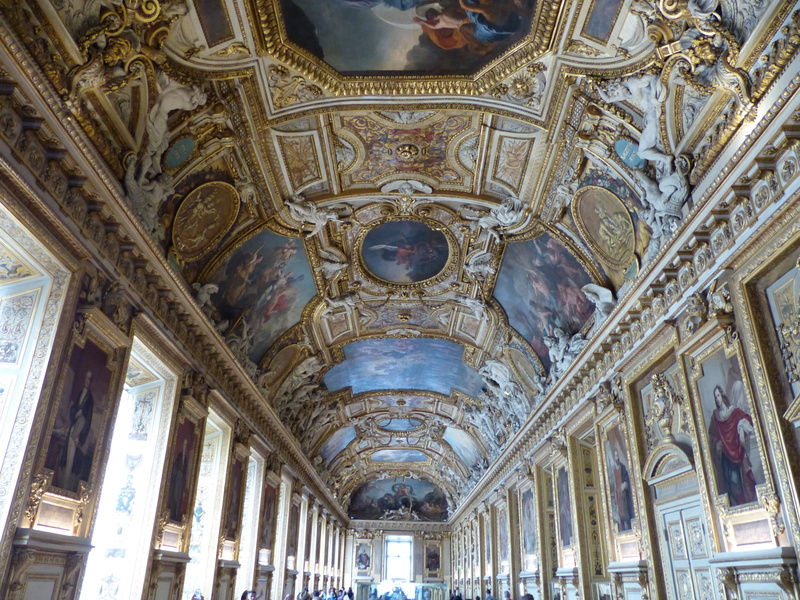 The ornate halls and ceilings were beautiful and even when I glanced away from a painting or a sculpture, the building was there to admire too. 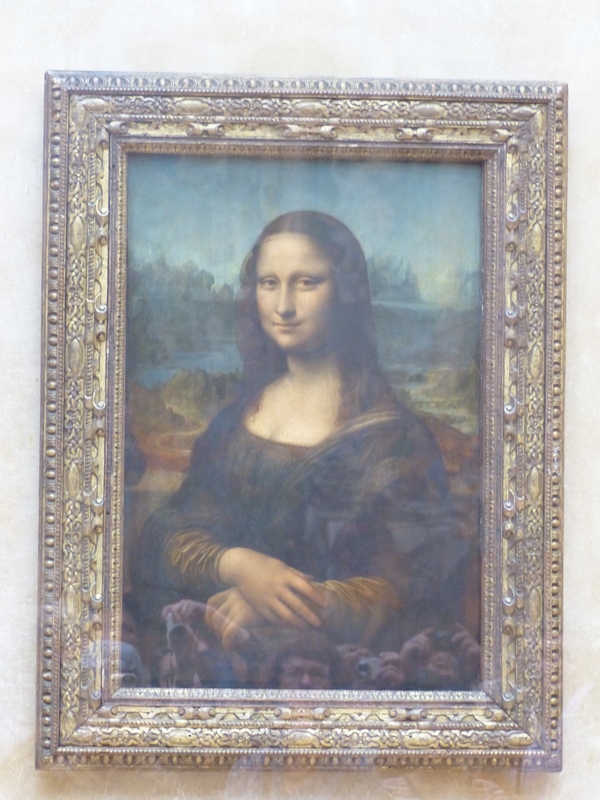 We met the lady herself, Mona Lisa and I was actually surprised by her size, as in she was bigger than I was expecting. Everyone who’s told me they’ve seen her, comment on how small the painting is, so I was expecting something quite teeny tiny, but she turned out to be quite “normal sized”. It was quite a “moment” to stand in her presence. In fact the whole time, I kept saying to myself, “I’m looking at a Delacroix! I’m looking at a Decamps! I’m looking at a Constable! 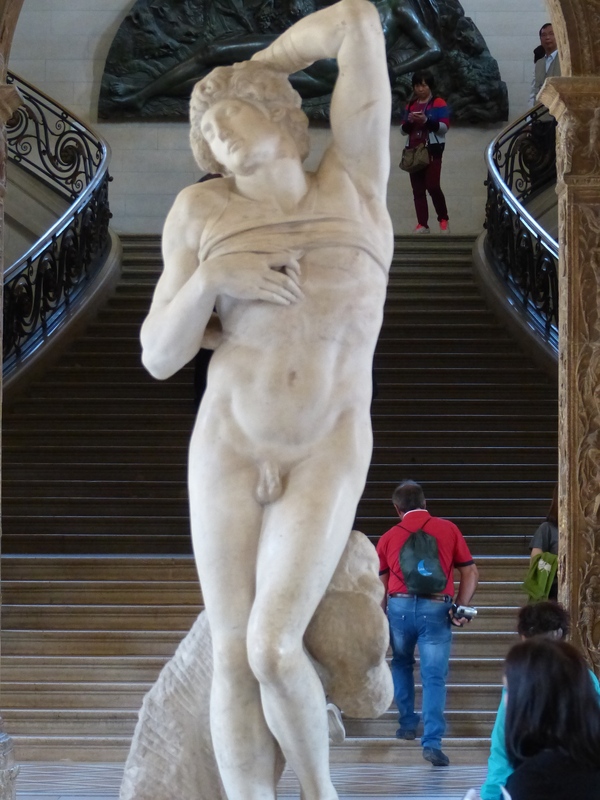 Michelangelo did that! Leonardo da Vinci painted that!” All my long ago art history classes were coming back to me and I was recognising names and artworks left right and centre and it was really quite something to experience! 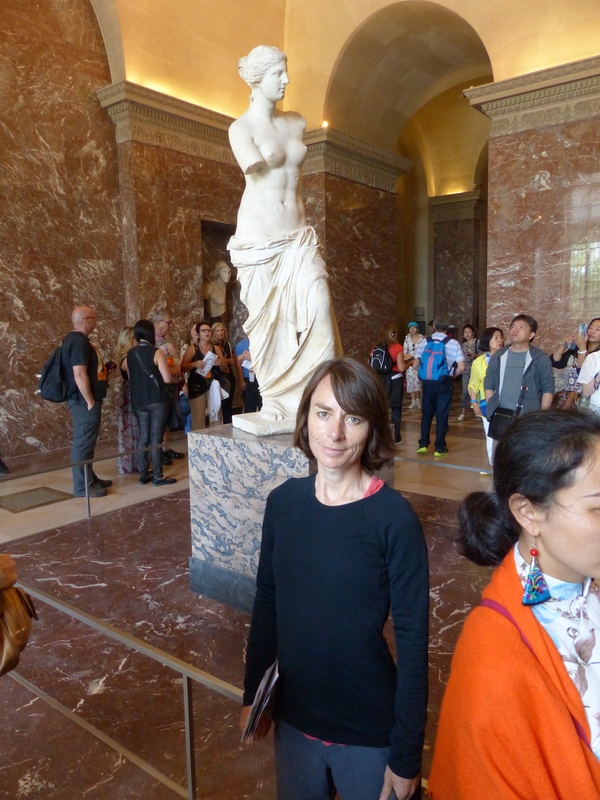 I even met the Venus de Milo! After feeling sufficiently full of art and culture, we left the Louvre and walked out into the beautiful warm day to seek some lunch and a park to picnic. We found some good vegan take-away and a little park that was tucked away off the street and sat on a step in the peace and quiet and filled our bellies as we chatted about what we’d seen and where to next. We ended up taking the Metro out to Bercy Village, a small pedestrian only village that’s been developed from 19th century wine storehouses. The village is actually 6,500 years old because in 1990 when renovations were being done on the site, artefacts were found from the Neolithic period. 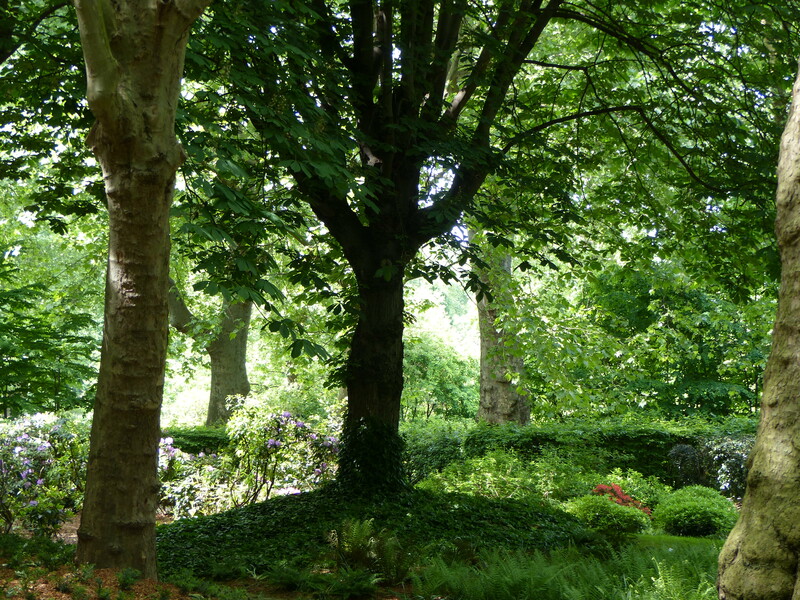 We then strolled into nearby Bercy Park and walked along the pathways through the trees and gardens. We saw a purpose built house for insects that I thought was great. 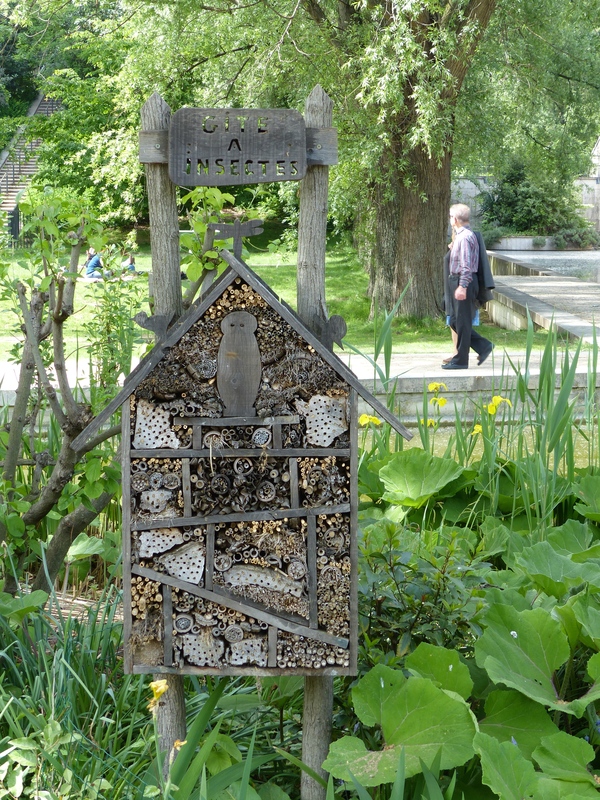 So the city has put beehives on the Opera to help the bees, Bordeaux had provided their pigeons with fancy, purpose built lofts and now Bercy has given the insects a gite in which to congregate. Nice. We found a patch of grass and Steve had a snooze and a snore while I read my book. It was nice to just have that time to sit in a nice park and enjoy the day, rather than feeling on the go all the time. The insects have their own home to go to after a long day of buzzing and pollinating. We caught the Metro back to the main train station to organise our tickets back to Normandy to catch the ferry and while we were there we did some surveillance on the type of train we will have to catch. Yes…it was as we feared…it’s another one with a tiny narrow doorway and three big steps up off the platform and into the carriage. It will be a case of having to unload the bikes on the platform, get the bikes on quickly as soon as the train stops, throw all the bags on after the bikes and then as the train takes off, get the bikes hung on the wall and the bags stored somewhere. I’m trying not to stress about it just yet! We had a lovely day. We had a nice mix of seeing the famous things and then just roaming the streets and nooks and crannies of Paris before taking some time out in a quiet garden. Plus, the sun shone! We’ve commented that we’re missing our daily exercise on the bikes, and certainly feel we are leading a quieter life at the moment, but it’s been a very pleasant interlude which has given us super memories for when we are next tackling challenges on the road. Hills…rain…wind…it’s these things that get us to places like Paris! What a reward! Stories and Sparkles and How Special Is That! Don’t think that you would be missing the horrible weather that we’re having here in Tassie at the moment. Nor would you be missing the start of NAPLAN week. Oh joy! How much longer are you in Paris for? I’ve heard about the awful weather back home! It is nice to be having some sunshine here though, it’s been a long time coming! One more day in Paris then catch the train north tomorrow and on the ferry on Thursday to head to England. The forecast for our arrival in 13C and raining! Oh well, back to the weather we’ve been used to! Love the special place for the insects 🙂 Enjoy the rest of your time in Paris. Thanks Jan. We’ve had a t’riffic time.